NETWORK FINALS: The DANCING WITH THE STARS season finale gained 0.1 in final numbers, and IZOMBIE lost the same. CABLE HIGHLIGHTS: Once again it was the NBA PLAYOFFS on top of Tuesday cable, with TNT’s game at 2.75 and the post-game THE DUNK KING at 0.78, while NBC Sports Net’s NHL PLAYOFFS game was at 0.64. 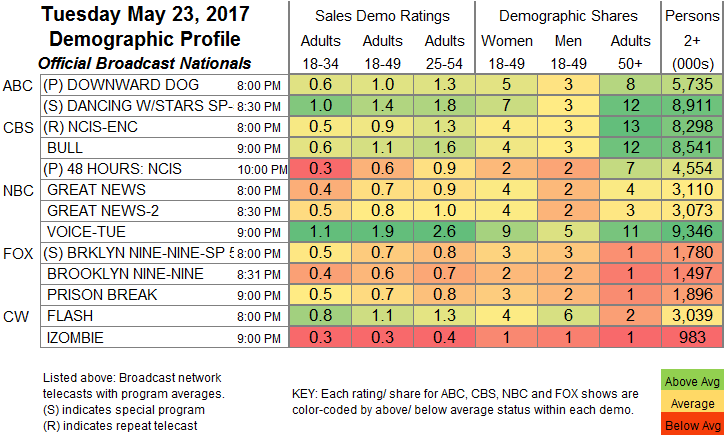 On USA, WWE SMACKDOWN climbed 0.12 to 0.80, and TEAM NINJA WARRIOR held at 0.27. OWN’s IF LOVING YOU IS WRONG ticked up to 0.48. On Discovery, DEADLIEST CATCH fell 0.08 to 0.47, and COOPER’S TREASURE was down 0.04 to 0.27. History’s FORGED IN FIRE dropped 0.06 to 0.44. Adult Swim’s midnight NEON JOE was up 0.01 from Monday’s installment to 0.43. On Freeform, PRETTY LITTLE LIARS returned from a week off down 0.04 to 0.41, while FAMOUS IN LOVE, with its lead-in back, improved by 0.03 to 0.12, and TRUTH & ILIZA was up 0.02 to 0.05. 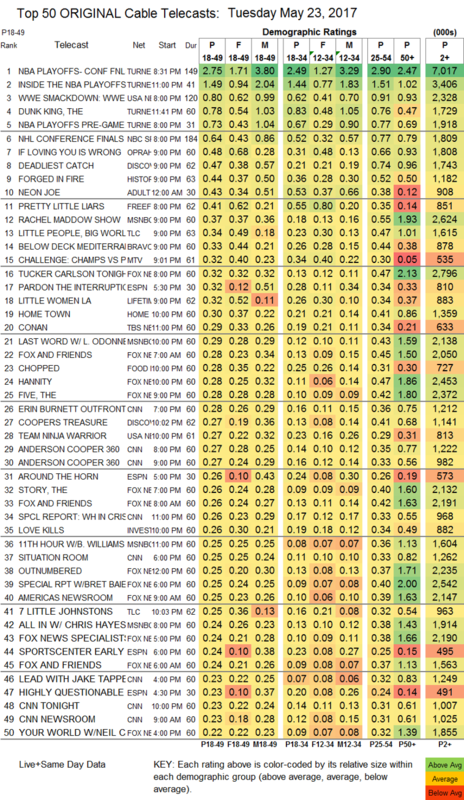 On TLC, LITTLE PEOPLE, BIG WORLD ticked down to 0.34, and 7 LITTLE JOHNSTONS was up 0.02 to 0.25. Bravo’s BELOW DECK lost 0.07 to 0.33. On MTV, THE CHALLENGE was down 0.01 to 0.32. On Lifetime, LITTLE WOMEN LA was steady at 0.32. HGTV’s HOME TOWN rose 0.03 to 0.30. On Food Network, CHOPPED gained 0.03 to 0.28, and CHOPPED JR ticked up to 0.21. On ID, LOVE KILLS fell 0.04 to 0.26, and MOTIVES & MURDERS was down 0.04 to 0.18. FX’s THE AMERICANS climbed 0.03 to 0.15. A&E’s BORN THIS WAY was at 0.15, compared to 0.17/0.14 for last week’s episodes. On NatGeo, GENIUS dropped a tick to 0.14, and BREAKTHROUGH was at 0.05. BET’s REBEL fell 0.04 to 0.11. Comedy Central’s PROBLEMATIC lost 0.02 to 0.10.